Akinyi Orinda, an associate in the Family Law and Fiduciary Litigation Practice, began her career in family law as a judicial law clerk to the Hon. Lon E. Farris of the Prince William County Circuit Court, Virginia. While serving as a law clerk, she gained exceptional knowledge of complex Virginia civil procedure, local court rules and critical insight into effective court room strategy. She applies this experience while advocating for her clients with passion and tenacity. 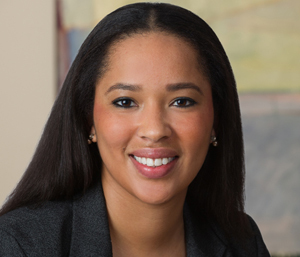 Akinyi focuses her practice on complex domestic relations and family law matters, including divorce, child custody and visitation, child support, spousal support and property distribution. She also has experience in negotiating and drafting complex parenting and marital settlement agreements. Prior to joining Shulman Rogers, she practiced family law in Northern Virginia. Akinyi received her Bachelors of Arts in History from the University of Virginia and her Juris Doctor from William & Mary’s Marshall Wythe School of Law, where she served as Notes Editor on the William & Mary Journal of Women and the Law. Prior to immigrating to the United States, Akinyi lived and traveled extensively abroad. Given her international background, she is knowledgeable of the various immigration concerns which may arise as a result of marriage or marital separation. Akinyi has also worked with clients engaged in international divorce and child custody matters. Lucy Akinyi Orinda, Securing Gender-Based Persecution Claims: A Proposed Amendment to Asylum Law, 17 WM. & MARY J. WOMEN & L. 665 (2011).